Varèse Sarabande release the soundtrack to the original SyFy series Krypton. The album is composed by Pinar Toprak. Centuries before Truth, Justice and the American Way, the grandfather of Superman, Seg-El, must redeem his family’s honour. With a cosmic evil reaching through time to destroy the House of El before the rise of its heroic scion, can the forbearer of steel prevent the destruction of much more than just his family or is more than just the planet doomed...? 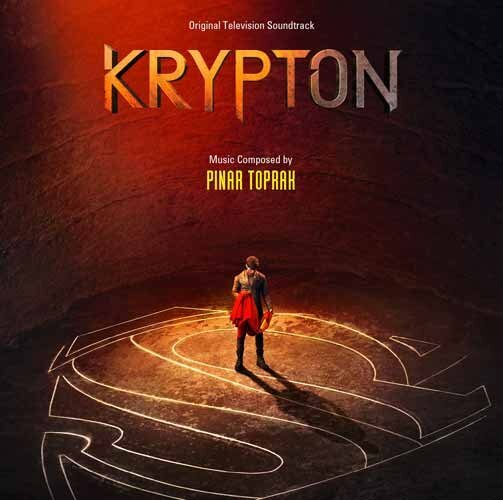 Pinar Toprak (Captain Marvel, Justice League, The Lightkeepers, The Wind Gods) delivers something a little different with her score for Krypton. Those expecting an epic, adrenaline pumping soundtrack in the vein of so many other superhero movies are in for a shock. What Toprak gives us is a more ambient, atmospheric score, but with deep and engaging themes. This, to my mind, makes the beautiful, subtle moments (like at the heart of 'The Trial Begins') even more impressive. There are numerous reflective and laid back themes, 'Fight with Honor' is probably the best example. And, there's a loving nod to John William's theme to the 1978 Superman movie in 'Welcome To The Fortress', 'Your Grandson's Cape' and 'Bye Bye Brainiac'. And while we're on the subject of homages, was that a little nod to Brad Fiedel's score for Terminator 2 I heard in 'Brainiac's Goon Squad'? For me, the two tracks that stood out on this 32 track (1 hr, 12 min, 09 sec) release, were the building menace of 'A Test of Sibling' and the closing track 'Bye Bye Brainiac', which houses numerous interesting themes. Toprak's music is certainly key in ensuring that the TV series has its own distinct voice and it's refreshing to see that rather than trot out a cliched superhero-esque score she rips up the rule book and makes her own mark on the genre.